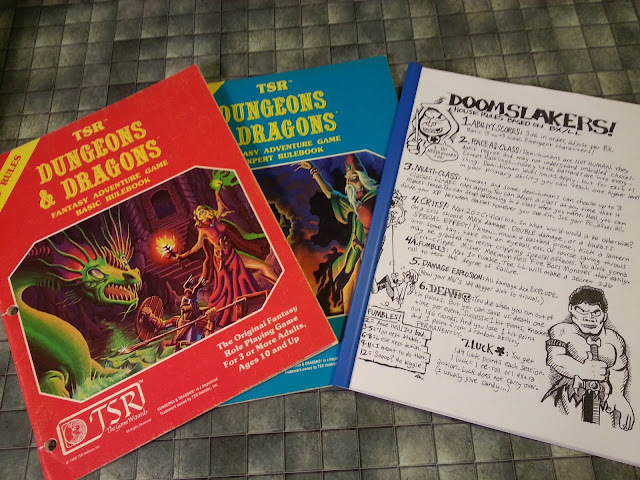 Okay, so I still haven't had the chance to scan any of my old D&D stuff. I don't have easy access to a scanner anymore, but I'm giving serious consideration to hijacking my son's new scanner this weekend... I'll be sure to keep you in the loop. (/wink) I also discovered, much to my dismay, that much of the electronic stuff I had hoped to post is on the hard drive of my desktop PC - which is buried somewhere in storage. 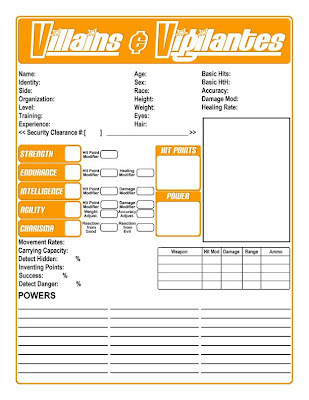 So, I've been rooting around a bit, trying to see what I still have access to that may be of interest - and I discovered this lurking on my hard drive: It's a character sheet for Villains & Vigilantes, the fifth RPG I owned. Back in the day, I made a ton of characters for this game, but never played it in it's pure form. 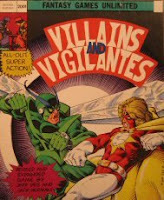 However, my nephew and I did, at one point, use it and TSR's Top Secret to make a mash-up of a game wherein semi-superpowered heroes hunted the supernatural. We only played this mutant of an RPG once, in a Fright Night-inspired scenario, but it was an absolute blast! A decade later, I ran a short V&V campaign for my friend Terry (er, sorry - I guess that's "Theron" now) and had a great time with it. Most recently, I introduced the game to my fiancee and my kids, all of whom loved it. I blame the fact that we didn't play more games on my own HADD. Actually, if you have the free PDF reader "Foxit" you can save changes to a fillable PDF - something I didn't know until I had been using Foxit for a while. That's good to know - I've only ever worked with the full version of Acrobat, so I have no experience with third-party PDF tools. Thanks for the tip, Paradox!